MOSCOW — One of the great victims of the Cold War’s propaganda was the reputation of the Russian man and woman. Icy, serious, malicious, mechanical, soulless is what we were told about them. Arrive in Moscow and see flowers placed at the foot of statues erected in tribute to the nation’s writers, visit a classical music performance at the Bolshoi Theatre attended by people of all walks, learn about the conflicts endured and how this nation’s World War II memorial museum is decorated with 27,000 glass tears because it couldn’t hold 27 million to honour every life lost, and you will never again perceive Russians as anything but a people with heart; and one that’s perpetually mending at that. This country — Canada’s enemy for so long — has been through a lot. Yet, it has maintained an affinity for arts and literature through regime change and hardship. Pushkin Square, named after the “Russian bard”, remains a meeting place for lovers despite the fact it was the site of an August 8, 2000 suicide bombing that killed 11. A statue of Alexander Pushkin, whose great-grandfather was African, stands tall facing Tverskaya Street, the city’s main thoroughfare leading into Red Square. Anton Chekhov’s statue is at the head of Kamergersky Street, a cobblestone pedestrian boulevard filled with cafés and flower shops that take you toward the Bolshoi. Chekhov, a precise author uniquely attuned to human nature, wrote “The Sea Gull”, and in honour of that famous play a gull’s wing has been adopted as the emblem for the Russian arts. A writing museum that was established by Leo Tolstoy still exists and several writers, including Nikolai Gogol, are buried at the state cemetery along with notable Soviet-era legends like Boris Yeltsin and Nikita Khrushchev. Each of the graves at Novodevichy (or New Maidens) Cemetery is a work of art itself, with a monument to the deceased that touches on the unique nature of his or her character. Pushkin is the most revered literary figure. Many Russians can recite verses from his poems and his name shows up everywhere, including at the fine arts museum in Moscow. 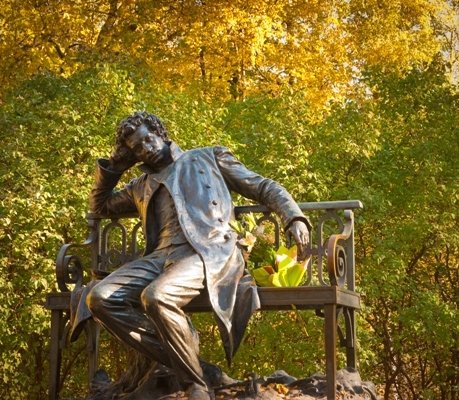 A popular restaurant, the Pushkin Café, is also close to the square that bears his name. Read the full article in the Toronto Star. Posted on December 16, 2010 at 7:10 pm in Travel Writing	| RSS feed You can	trackback	from your own site.